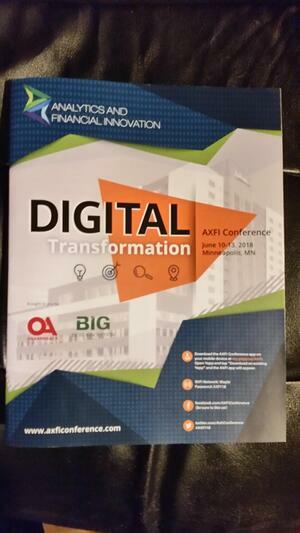 It was another great time at the 2018 AXFI Conference that took place June 10th through 13th. It started out with a very informal band rehearsal at the home of Paul Ablack, the CEO of OnApproach. We were getting ready for what's become an annual tradition, a music performance on the Sunday evening before the start of the conference. Who knew the tech world included so much musical aptitude?! There was a lot of talent on the stage with John Best and Ed Gonzales of Best Innovation Group, Laura Wiese and I (both former employees of Best), Paul Ablack, and two of our friends Shawn Tyson and Andrew Thornbrough. We even had Julie Esser of CU Ledger come up for a song. I might be a little biased, but we ROCKED! This is our second year performing as a band at AXFI and I think we can now call this a tradition. Special thanks to Paul for his hospitality, opening his home for rehearsal. If you happen to run into one of us, you'll want to ask about the “no shoes” story that drew many jokes at my expense. The party started at rehearsal and continued all the way through the show later in the evening. What can I say, it’s always good to have some fun and entertainment at conferences. It can't be all business all the time, right? This FinTech conference draws some of the most innovative and technical talent in the country. The result is a collection of great speakers presenting to inspire and teach. We even got to hear more about John's recently launched book, ‘Breaking Digital Gridlock’ which made for another great topic of discussion. Hats off to the AXFI conference and all the people and sponsors that make it possible. I just couldn't wait to share with you what a great time it is in hopes that you'll join in on the fun next year. Come and see the live show right before learning about the latest innovations the FinTech world has to offer.